Gallery Of Court Reporting Related License Plates | Todd Olivas & Associates v3.0 | Court Reporting Services in Orange County, Riverside, San Bernardino, San Diego, Los Angeles, Irvine, Santa Ana, San Jose, Sacramento, Fresno, San Francisco, Bakersfield. TO&A employs no court reporters, interpreters or videographers of our own. The providers we send are fully qualified and reliable independent contractors. Slasher - Software Release Makes Court Reporting Teachers` Lives Better! Ever seen a court reporting related license plate on the road? Or better yet, do you personally own a vehicle with a court reporting vanity plate? 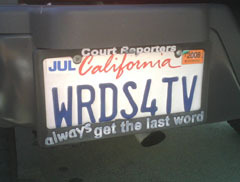 Please send a photo to licenseplates (at) toddolivas (dot) com and we will post a gallery of the best ones out there. 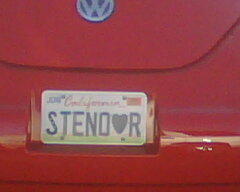 STENO LOVER is the first one that I personally found while visiting a court reporting school in Southern California. Send me snapshot of your steno plates!